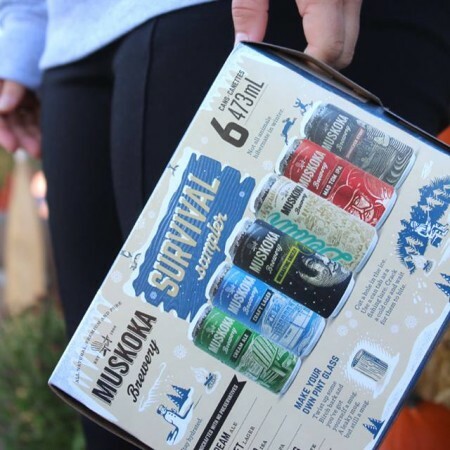 BRACEBRIDGE, ON – Muskoka Brewery has announced details for this year’s version of it’s annual winter mixed pack, as well as several other seasonal releases for the cooler months. The Winter 2018 edition of the Survival Sampler Pack is a 6-pack of 473 ml cans that includes two seasonal beers – the returning Shinnicked Stout and the new Hibernating Grizzly Grisette – alongside core brands Craft Lager, Detour Session IPA, Mad Tom IPA, and Cream Ale. The new pack is available now at the Muskoka brewery store and online shop, with LCBO, Beer Store, and grocery store distribution to follow in early October. The brewery has also announced upcoming stand-alone single can releases for Shinnicked (brewery/online and LCBO) and Hibernating Grizzly (brewery/online), as well as the return of the Kawartha Dairy collaboration Salty Caramel Truffle Bock (brewery/online and grocery stores). Finally, five vintages of Winter Beard Double Chocolate Cranberry Stout – from 2014 through to the new 2018 batch – will be available at the brewery store starting November 1st. The 2017 vintage will also be sold online via the brewery and LCBO websites, and 2018 will be on the shelves at LCBO stores throughout the province.